Deputy director for research at the State Scientific Center of the Arctic and Antarctic Research Institute of the Russian Federal Service for Hydrometeorology and Environmental Monitoring, PhD (Physics and Mathematics), member of the Scientific Expert Council of the Maritime Board of the Russian Government, the Scientific Coordination Expert Council of the Civilian Marine Technology Development Federal Targeted Program, the scientific councils of the Federal Service for Hydrometeorology and Environmental Monitoring, the Russian Academy of Sciences Scientific Council for Arctic and Antarctic Research and other councils, author of over 70 scientific articles, co-author and editor of four monographs. In 1972, Danilov graduated from the Department of Oceanology at the Leningrad Institute of Hydrometeorology with a specialization in engineering/oceanography. His first experience in sea expeditions was aboard the institute’s ship, the Nerei. He began his professional activities in 1972 at a base of the expeditionary fleet of the Main Hydrometeorological Service Administration of the Ukrainian SSR in Odessa (subsequently, the Odessa division of the State Oceanographic Institute). He participated in sea expeditions to the northern and tropical Atlantic as an engineer of the Ernst Krenkel oceanographic unit. Research associate at the Arctic and Antarctic Research Institute since 1974. In 1982, Danilov defended his PhD dissertation in oceanography. In 1991–1992, he served as the Russian research director of Weddell-1, the world’s first Russian-US drifting station in the Southern Ocean. 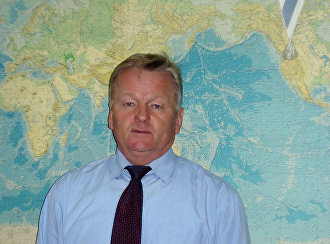 In 1993, he was appointed deputy director for research at the Arctic and Antarctic Research Institute. Danilov participated in developing the Antarctic Study and Research subprogram of the World Oceans federal targeted program and a concept, action plan and research program for Russia’s participation in the 2007/2008 International Polar Year. He is head of the IPY Scientific Information and Analysis Center and was a member of the IPY Interagency Scientific and Coordination Committee. For his work at the institute, Danilov was awarded the 300 Years of the Russian Fleet medal, the Honored Hydrometeorology Professional of Russia Вadge of Distinction and Honorary Certificates of the Russian Government, the Federal Agency for Science and Innovations (ROSNAUKA), the Committee for Science and Higher Education at the St. Petersburg administration, the Federal Service for Hydrometeorology and Environmental Monitoring and the Arctic and Antarctic Research Institute. In 2007, he was awarded the title Merited Meteorologist of the Russian Federation and in 2013 he was awarded the Order of Marine Services for the implementation of the project to pierce the ice shield of subglacial Lake Vostok in the Antarctic.